Save the liquour of your largest Oysters, season them with Pepper, and Ginger, and put them into a Coffin: put in a minst Onyon, a few Currins, and a good piece of Butter. Then poure in your sirrup, and close it. When it is bakte, cut up the Pye, and put in a spoonefull of Vinegar, and melted Butter: shake it well together, and set it in againe into the Ouen a little while: Then take it out, and serue it in. THe Paste for your thin bake-Meats must be made with boyling liquor, as followeth: When your liquor (which is water) boyleth, put to every peck of Flower two pound of Butter, but let your Butter boyle in your Liquor first. A bake-meat is another word for a pie, and a peck is equal to about 16 dry pints. I only wanted to make a small pie just for me – plus I didn’t have many oysters – so I decided that I should divide the recipe by 16. 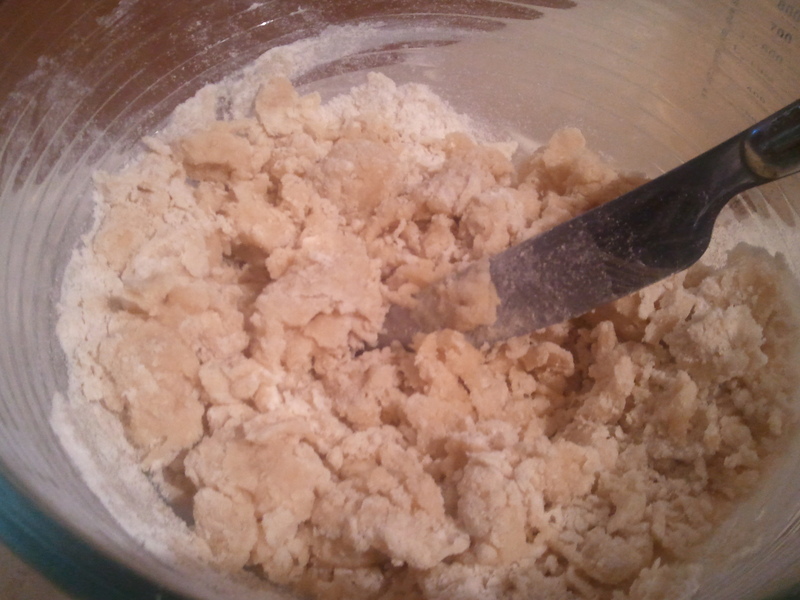 I used 1 dry pint of flour (16 oz), and there are 16 ounces in a pound , so that means 2oz butter. I heated the butter with 100ml of water and added it all to the flour. I stirred with a knife at first, and then kneaded the dough when it started to come together. After making the pastry, I lined a shallow cake tin with just over half of it. I then put the oysters in the bottom, then sprinkled them with a little ground ginger and a grinding of pepper. I then added a small finely chopped onion, a little bit of butter, and a couple of currants. I realised I probably should have got two tins of oysters, there was not really enough to cover the pie base, so I gathered the edges in to make a little parcel and put another piece of pastry over the top. This actually only used about half of the pastry. I put it in an oven, preheated to 180, and baked it for about half an hour. I then took it out, cut a hole in the top, and poured in a few drops of balsamic vinegar and about a tbsp melted butter. I shook the pie to distribute the oil and butter, then returned the pie to the oven for another 10 minutes. I did try the pie and it was…. well, to be honest it wasn’t particularly nice. I was hoping that the unusual combination of ingredients would turn out to be unexpectedly delicious (think chocolate and chilli, or strawberries and vinegar). Alas, it was not to be. The currents were not a welcome addition in my opinion. Maybe it would have been better with fresh oysters, but the whole thing seemed to me to be full of very strong clashing flavours. 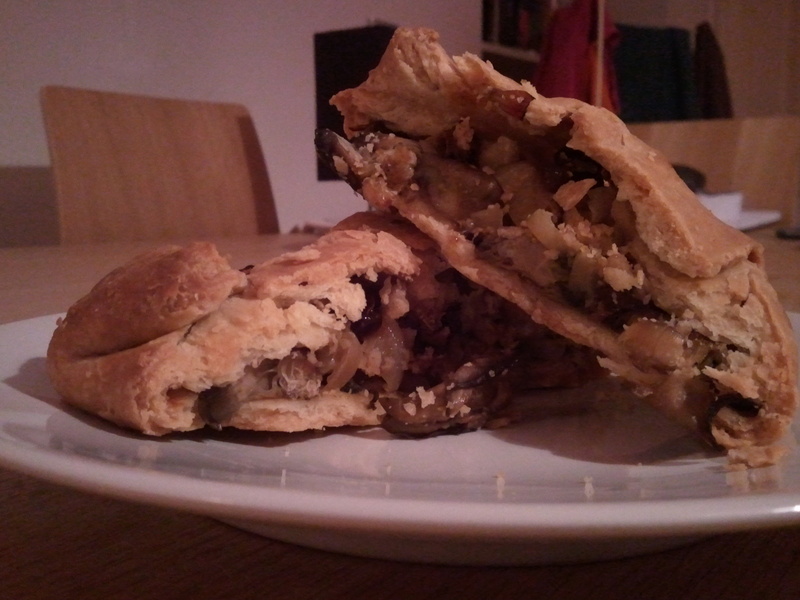 On the plus side, the pastry was quite interesting, it was crisp and flaky, much crisper than regular short crust. I’d certainly like to try another pie. I’m reluctant to post a recipe here since as I wouldn’t really recommend eating this let alone cooking it! Next time I’ll try to cook something more palatable. 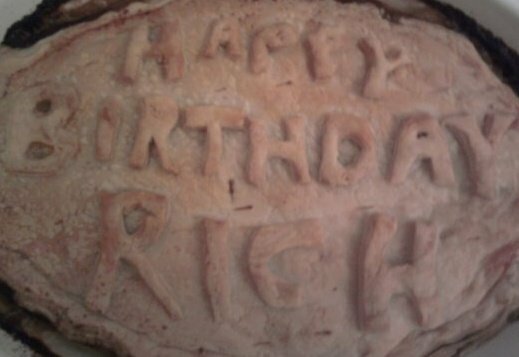 A pie I made a few years ago for a friend's birthday. I believe it was chicken and mushroom. Apparently it’s British Pie Week this week. I am a big fan of pies, and I have been wanting to make one for this blog for a while – pie week seems like a good time a try a recipe out. References to pies are fairly frequent in the literature of the period. Much like today, they seem to have been a popular, if unhealthy, food – readily available on city streets and at courtly banquets alike. Hay’ny Boules or Trayes to mende? The verse above is from an anonymous 1610 broadside ballad, I Have Fresh Cheese and Cream. The ballad is about a young man who is in love with a London dairy maid, and this verse is wonderfully evocative of the various foods and other items available on the London streets, including the delicious-sounding “Hotte Pippin-pies” (pippins are apples). Pies were popular with the upper classes too. In 1672, Elias Ashmole published a book containing details of the activities of the Order of the Garter, The institution, laws & ceremonies of the most noble Order of the Garter collected and digested into one body. Menus for various feasts are contained in the book, one such banquet included seven different types of pie – pigeon pie, venison pie, oyster pie, beatilia pie, tongue pie, skerret pie and lamprey pie. When a man getteth the Stranguria or difficultye to make water / the~ anoynt him his nauel wt suet warmed & no more / & it auoydeth very shortly. The pacient oughte to vse thynges of easye digestion, and in smal quanty|ty, and ought to absteine from breade to litle leuened, cakes, tartes pasties, pies, hogges fleshe, beafe, and poudred meates, and fumishe. Generally all sortes of Pasties and Pies yéelde but litle nourishment in comparison of meates made with brothes. Yet many times they do good to them yt are full of humours, & pleasure them that would dry vp, and make their bodies proper. For that sir, she is prouided: for you shall no sooner enter but off goes your rustie skabberd, sweete water is readie to scoure your filthy face, milk, & a bath of fernebraks for your fustie bodie, a chamber perfum’d, a wrought shirt, night cap, and her husbands gowne, a banquet of Oysters pyes, Potatoes, Skirret rootes, Eringes, and diuers other whetstones of venery. 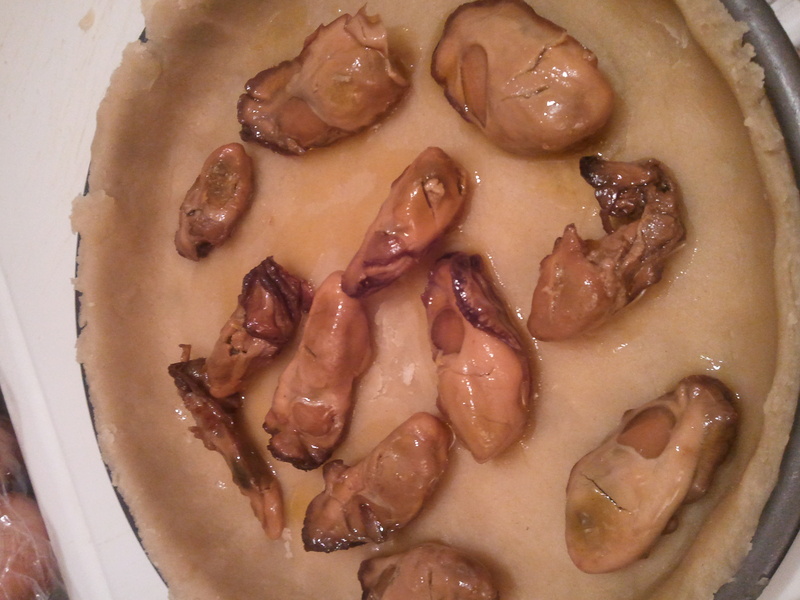 I’ll be cooking the oyster pie on Thursday afternoon, and I’ll hopefully be posting the recipe later that evening if all goes to plan.